I went on my second grubcrawl with a theme - Bikes & Bites. Cline organized this crawl so that we would bike from location to location. The five restaurants were spread far enough apart to need a bike, but not too far as to wear you out. I caught up a little with Cline and asked what had been going on. I had thought his venture might have been dying since he hadn't really been posting any crawls and I had pretty much given up checking his site. He explained that they take a break during winter because of the weather and then he also wanted to avoid the other big events like Jazz Festival and the Cinco de Mayo block parties. He said he was getting more private party and corporate business to keep him busy. He told me he had two more crawls already in the works - one with the Monarchs in August and another with the River City Rollergirls in September. Good to hear. Our first stop was my favorite but I didn't get pictures. We started at the 4th Street Grille at 4th and L. They had a delicious spread of BBQ beef sliders, Thai chicken skewers, and potstickers. Even though I knew I had to save room for the other venues, I still chowed down on 3-4 sliders and the same in skewers. This was because I knew I wouldn't be interested in the next stop's food. The sliders were nice with fresh buns and a nicely flavored shredded beef that was not wet enough to give you a soggy bun. They also filled them to the right amount so that they were not messy to eat. I would order them if I was a paying customer. Same with the skewers. The chicken was cooked in a marinade and then they left a pitcher of peanut sauce to dip your skewer in. The sauce was interesting because it definitely had a Thai influence but also had a slight gravy taste to it. Not bad, I just found it interesting. We biked on to the Fox & Goose at 10th and R where they set out some pretty basic (and greasy) pub fair. They did bangers (sausages) in blankets and fried zucchini. Knowing that we had three more places to go, I just passed on this stop. The next three stops were all new for me. First was Hanger 17 at 17th and S. I had never gone here because I knew it to be known for the bar and sports watching. I, of course, only care about food and so I'll always prefer going to a restaurant versus a bar with food. Still, I learned some new things just from the crawl. First, one of my fellow crawlers told me that Hanger 17 has a great brunch. They offer a number of varieties of Eggs Benedict. She also said that they have bottomless champagne and mimosas for $5 with brunch. For our crawl stop they did put out a lot of food. Here you see some polenta cakes with BBQ pork and creme fraiche and then some chicken nachos. I didn't care for the first because I don't like polenta. Plus, it didn't help that both these dishes were served cold. The chicken nachos were pretty good and had a nice bite to them - but I would have liked them and eaten more of them if they had been hot. 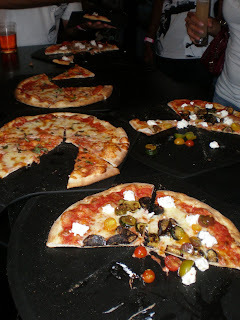 The pizzas were good, especially the Margherita. It was really garlicy and had the cheese, tomatoes, and basil true to the name. I did not try the pepperoni because I knew our next stop was Hot Italian. Hot Italian is on 16th and Q. I had been meaning to go and try it out, but never had the time. It's an interesting place because it has the restaurant, a gelato bar, and then a store with Italian clothes, mopeds, and motorcycles. Our group was set up in the store area and had to wait a while before they brought out the pizzas. You can see they were pounced on pretty quickly. I was really disappointed in the pizzas here. Some people seem to really love this place, but with so many pizza places around, you really need to stand out. I tried their version of the Margherita and didn't like it. They used sauce instead of sliced tomatoes and I didn't find the sauce tasty at all. One of my fellow crawlers told me that they think that we were provided lower quality pizzas for the event than what he's had when he's been there for dinner. He said the crust seemed even thinner than usual and there was less cheese. We discussed the value of putting your best food forward when you are going to be a part of the grubcrawl. After all, you will have some new customers basing everything on what they sample. Based on the pizzas I sampled here, I was not impressed. So now I have no reason or interest to ever go back. If they did indeed scrimp on the event pizzas, shame on them. And if this was their standard quality of pizza? Then sorry, I'm going to Masullo's instead. I was so put off by the pizzas here that I biked early to the last venue. As I road I thought to myself how many other pizza places were in the vicinity. I rode right past California Pizza Kitchen and another and then mentally listed: Masullo's, Paesano's, Chicago Fire, Pieces, Giovanni's, Zelda's, not to mention the chains like Round Table. Then throw in restaurants that just have pizza as one of the items on their menus like Hanger 17 and Cafe Bernardo do. In the downtown area I'll be sticking to Masullo's and Chicago Fire. The final destination was the new secondary location of Tokyo Fro's on 15th between I and J. Even though Tokyo Fro's has been around on Fair Oaks Blvd. for years, I never ventured there either. So I was curious to try another downtown sushi location. They put out five rolls on numerous platters so that there was plenty for all. The rolls were good and I'm willing to go back to try them again, but didn't find anything that rocked my world. But then again, could I really expect a super great roll on the crawl? That's probably gonna have to wait for the day that I sit down and pay. The staff were very friendly, though, as we waited for the rest of the group to show up. And, like their original location, this one turns clubby as the hour turns late. I'm not into the clubby pick-up scene anymore and I was entering into a food coma anyway. It was 10:00 by this point and so I climbed on my bike, put on my headlamp and headed for home. I'm glad the grubcrawls are back. They are worth the $25!